Summer is definitely an eventful season in Tokyo. And as much as you may see about fireworks, there are a number of other fantastic summer festivals happening in different corners of the city that are very much worth heading out for! This festival takes place on Kagurazaka, a central hillside covered in traditional streets. The first two days of the festival consist of the "Hozuki-ichi," a market for Chinese lantern plants. Also known as winter cherries or strawberry ground cherries, they look like potted plants with strawberry-shaped paper lanterns for blooms. While the Hozuki Market in centered around Bishamonten Zenkoku-ji Temple at the top of the hill, from Friday evening the entire street is filled with groups of dancers performing the Awa Odori. This dance tradition originates from Tokushima Prefecture in Shikoku, and has been featured on Kagurazaka since 1972. Throughout the festival period you'll find yatai (street stalls) selling food like takoyaki and okonomiyaki, and you can also get special deals at many local shops if you show up wearing a yukata summer kimono! Hozuki Market: July 26-27, 2017 (Wed-Thu), 5:30 – 10:00 p.m.
Awa Odori: July 28-29, 2017 (Fri-Sat), 7:00 – 9:00 p.m.
Toro nagashi literally means "flowing lanterns." In Japan, paper lanterns are traditionally floated down rivers or into the ocean to guide the spirits of the dead to the other world. The Asakusa Toro Nagashi occurs along the Sumida River. It was first begun in 1946 to commemorate the victims of the Great Kanto Earthquake of 1923 and firebombing of Tokyo, but was halted in 1965 after new flood walls blocked access to the river. Construction of the Shinsui Terrace at Sumida Park enabled the festival to resume in 2005. It's incredible to see all the lanterns floating down the river with Tokyo Skytree in the background. You can buy your own lantern and release it into the water, with lantern sales starting at 3 p.m. Date: August 12, 2017 (Sat), 6:30 – 8:00 p.m.
Not far from Kagurazaka you can find Yasukuni Shrine, the venue of the Mitama Matsuri, or Mitama Festival. Along the approach to the shrine some 30,000 paper lanterns, or chochin (提灯), are lit to commemorate the war dead and pray for peace. Drawing some 300,000 people each year, the Mitama Matsuri is one of Tokyo's biggest Obon festivals, marking the season when the spirits of people's ancestors are believed to return to visit them. The Mitama Festival actually fuses a number of elements from major festivals throughout Japan: Tanabata streamers hang from the shrine gate, and depending on when you arrive, you can also see mikoshi parades, traditional dance performances and even illuminated Nebuta floats from Aomori. Date: July 13-16, 2017 (Thu-Sun); lanterns lit from 6:00 – 9:30 p.m. 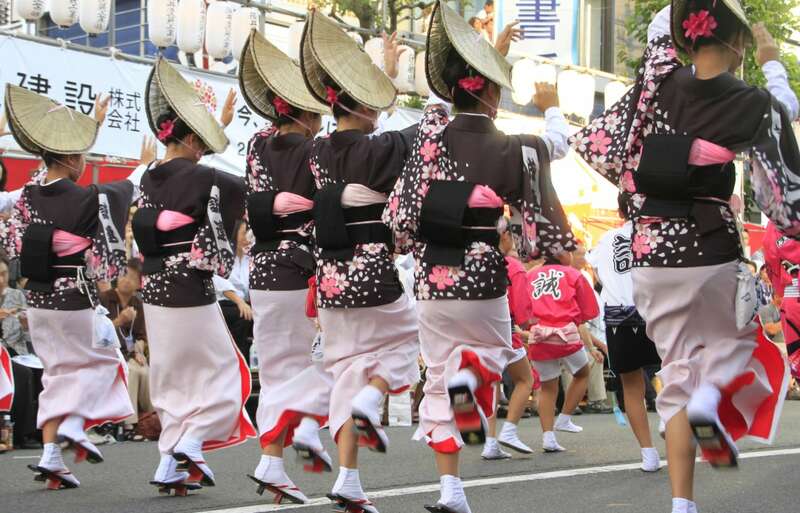 Inspired by Tokushima's Awa Odori, this festival began as an imitative "Idiot's Dance" (Baka Odori) in 1957. Under the tutelage of Tokushima immigrants it developed into a full-fledged Awa Odori by 1963. 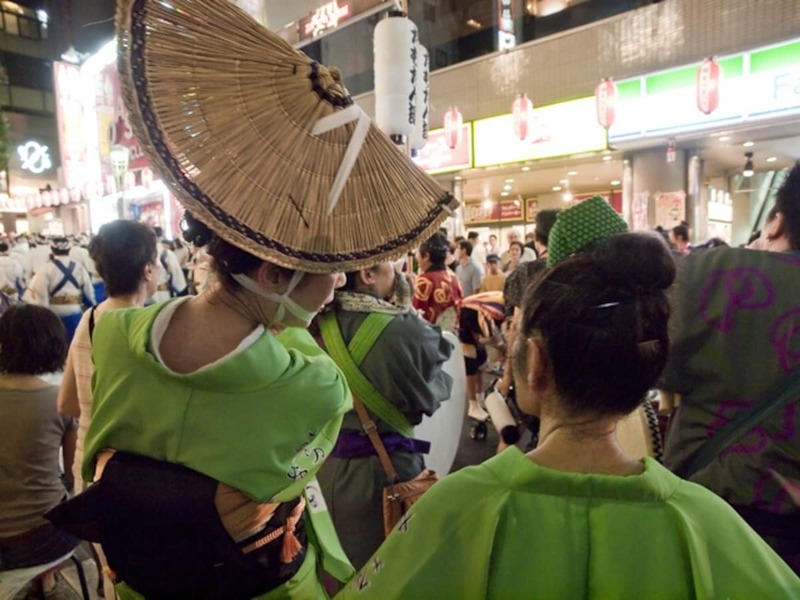 The Koenji Awa Odori happens on the final weekend in August each year, when the whole shopping area by Koenji Station is overrun with performances from some 10,000 dancers. Drawing roughly 1 million spectators, it is the largest Awa dance performance in the Tokyo area, and a major event on the local calendar. Date: August 26-27, 2017 (Sat-Sun), 5:00 – 8:00 p.m.